Thousands of gay-rights activists marched on Washington on Sunday. (CNN) -- This week in iReport, hear the inspirational story of a teen who struggled with obesity and eventually became a muscular fitness coach. Also watch as thousands of gay rights activists march on Washington, and see reaction to Obama's Nobel Peace Prize from around the world. Check out the video , or browse the stories below. • Obama receives Nobel Prize: We got a spirited response to the unexpected news that President Obama had received the Nobel Peace Prize. We even got a congratulations for the president from 32,000 feet up! And Martin Wik Fowler, who comes from Norway, where the prize was presented, interviewed fellow students at his school in Costa Rica to find out their views. 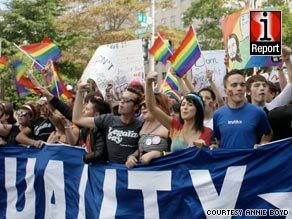 • National Equality March: Thousands of gay-rights activists took to the streets Sunday during the National Equality March in Washington. People were calling for equality in marriage and an end to the "don't ask, don't tell" policy. Folks of all ages from different backgrounds, gay and straight, descended upon the city to send Washington a message. iReporters captured dramatic images, from the huge crowds to couples standing united. • Overcoming obesity: We asked the iReport community to help us tackle our nation's problem with obesity. We received many inspirational stories, but one that really stood out was from Charles D'Angelo. D'Angelo transformed himself from chubby teen who ate his lunch alone in a school restroom stall to avoid bullies to a muscular fitness coach who dedicates his life to helping children overcome obesity.